Save by ordering 1000 bags ($0.70 each) - click here. Choose from black, green, orange or white. All colors may not be in stock, but we can order them; if that's the case, plan on adding about 4 business days. 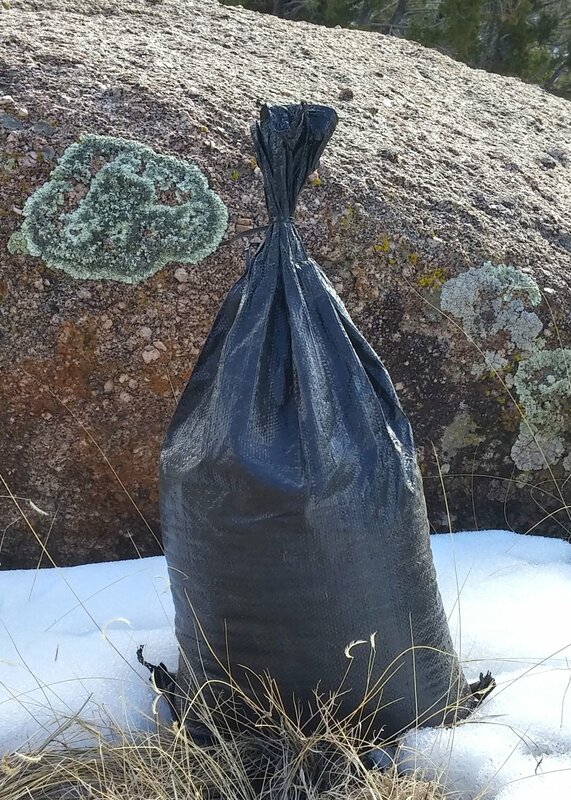 These are our best sandbags and are very heavy duty (4 oz/yard, heavier than many tarps). Depending on use, they can last for up to four or more years. Their heavy construction resists rips, punctures, abrasion, and they come very close to being waterproof. They're manufactured domestically, and come with hemmed openings (a big plus when filling), folded double-stitched bottoms, and heavy-duty, bomb-proof tie cords. While rated to last 4 years or longer, sustained exposure to high-level UV & IR, abrasion, rough treatment & other factors may affect how long they'll actually last. But we've had several of them laying around outdoors for several years now, exposed year-round to sustained high-desert sunlight, high UV, freezing, and we'll occasionally abuse them by kicking them & throwing them around. They tend to fade slightly, get softer & more pliant, but so far we haven't had one fail yet. We're impressed. We think you will be, too. These bags are currently available only in the one size (14.5"x26"). If visibility is important (think: trip hazard) then choose orange or white. If you prefer bags with a low profile, then black or dark green might be better choices. Free shipping to lower 48. Please allow 5-10 business days. If you're in AK, HI, Puerto Rico, Canada and abroad, please contact us for rates.